Few weeks ago when Windows 8.1 was released to the public, it came with KMS v6 which had new kind of encryption. KMS v6 had disabled a lot of old activators and there was no way to activate Windows 8.1 nor there was any way to activate Office 2013 on Windows 8.1. Some of the leet haxOrs have managed to crack the KMS v6 encryption thus bringing it back for activation purposes. NOTE: If you had installed Office 2013 on your earlier Windows 8 installation, you will find that the Office 2013 had begun to show "not activated" errors after installing Windows 8.1. The new KMS activator will be able to fix those problems. If you are having a new system with Windows 8.1 and not able to activate Office 2013, this activator will definitely help you activate Office 2013 with very little efforts. Please note that this activator will not activate Windows 8.1. It is only meant for Office 2013 on Windows 8.1. If you want to download the Office 2013 Key, Please like this post by clicking the like button and then tweeting it on twitter and then comment below. The key will be sent to you. A new Windows 8.1 KMS activator will be posted soon on nuclearrambo.com! As Promised, the KMS activator for Windows 8.1 has been posted. Head over there to get your Windows 8.1 activated. I have sent the key to you sir. Enjoy! Please send key, thank you. Sent the key few seconds ago. However, can I have the key, please ? I like it but didn’t recevied my key ? Thank you for the key but after all steeps without issue office is still waitting for activation ! Please try adding this kms host: 178.164.206.7 instead of the .edu address above. It will work. It doesn’t change! Office is not activated…. TRy to activate after a few hours. The server might be down. It should work, I activated my office on my new pc 4 hours ago. Always the same issue ! Make sure your firewall is not blocking it. I stop the firewall but always the same! Can I get the key now? Please send me the key… Thanks! Sent the key to everyone who requested. Please check your emails. Hi, thanks for the infos! Key? Send me the key, please. Pls send me the key. Thank you. I have tried couple of times to get the key from link provided in the steps for activation, But due to some reason the Site does not show. 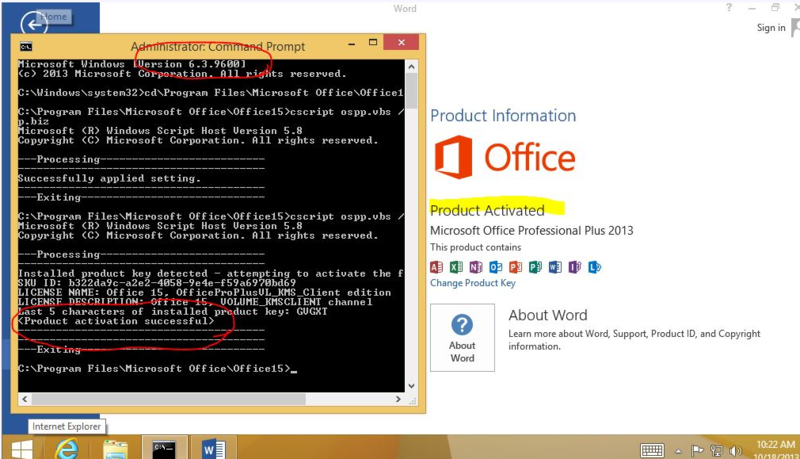 could you please share the key for MS Office 2013 activation on Win 8.1. Key sent to those who liked this page and shared on facebook. as you will tell I am not very Knowledgeable on these things but I have a question, I have installed and run the KMS and it has activated by MO Pro + 2013….can i now remove the KMS? Hey I tweeted this and liked it on facebook. Can I have the key? I liked on FB, Tweeted on Twitter. Please send key. Thank You. Done everything requested… Key Please! after putting KMS activitation key i.e. product key it is showing error.